Chris Matthews looked as though he saw the men with the nets coming for him, the tingles evidently having traveled from his leg and lodging in his frontal cortex. An astonished Bill Maher tweeted that, gee, this Obama fellow appears to need a teleprompter to speak coherently. 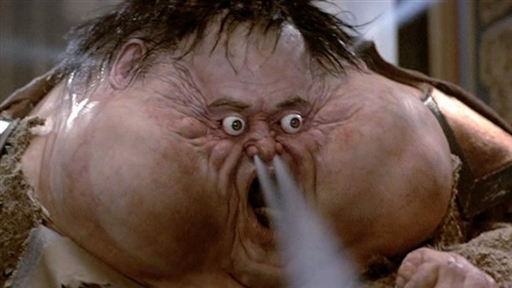 On MSNBC, Al Sharpton’s noggin resembled Thunder, the third Fury, who at the end of Big Trouble in Little China just realized his master Lo Pan lay dead. Rachel Maddow could do no better than echo the fans of the team that just lost the World Series, when she said Mr Obama should have won because he is the better man. Mr Obama himself was reduced to pulling out a preprepared joke on Donald Trump—-Donald Trump!, for all love—a quip so bad that it landed with a squish and which everybody immediately pretended never happened. Yes, overall it went well for the forces of Good. But here’s the curious thing. This morning we hear voices aplenty saying, “Where was this Romney hiding?”, “Who is this guy?”, “Why hasn’t he acted like this before?” and the like. My dears, the Romney of last night was the Romney of last week, and of last week, and the Romney we will have next debate. So why the widespread misperception? The only change was last night we saw him without his ever-present media filter. Strike that: no. Without most of his media filter. Did you, like everybody else, feel that Romney ran away with the microphone and dominated the airtime? That he went way over his alloted time? Not so. In fact, Mr Obama held the floor four to six more minutes than Romney, a substantial margin. How could this be? Jim Lehrer did his best to interrupt Romney several times, pestering him with small questions, an act he tried only once with Obama. In this debate, the mainstream media was forced to watch from the sidelines, and silently, too—although from watching Twitter you formed the idea that one of them was going to be like that guy in the crowd who saw an opposing player running unimpeded for a touchdown and who burst forth onto the field to tackle the ball carrier. We weren’t bothered by Lehrer’s standard technique because he was one lone man, and a feeble one, too. If this debate would have been structured so that a panel of media sat in magisterial judgment (their usual pose), they would have peppered Romney with questions like, “Why is Mr Obama the best president we’ve ever had?” and then cut him off before he could finish a sentence. This was the real Romney. This is the man the public were finally allowed to see. What will be the effect? Update More proof of the conjecture: journalists of the left are pummeling Lehrer for not “controlling” the debate better, i.e. shutting Romney down and bolstering Obama. Update Corrected time spent by Obama talking; there are various estimates. All say Obama had more minutes. Romney did not mention that he would cut my capital gains tax. Yes, just mine. So I was a bit disappointed, but I am still hopeful it could happen if he is elected president. Well, maybe the GOP has pulled a rabbit out of the hat. Romney came across quite strong. Great body language, too. His smile rarely wavered and when he spoke, he looked directly at Obama. The O wouldn’t even look in his direction when speaking and only with glances while listening (assuming he was listening). Maybe he’s a good actor. We had an actor for president once who wasn’t all that bad. So maybe being an actor isn’t so negative. Nice tie color choices: read and blue. I wonder who thought of that. Romney had black stripes in his tie. I seem to recall: Never, unless you are doing a guest stint with the Blues Brothers or are wearing a tuxedo, have black in your tie. mentioned on some post somewhere. So he loses some points. The O had about 3 minutes more than R. I doubt i mean much. CNN also had a running graph which I guess was to show Undecided response. It wasn’t explained and I have no idea where they got the info for it. If it was real, Romney was a fairly clear winner. OTOH, both of the got responses in the plus side (but Romney’s was usually larger). Obama got some negatives. The O had about 3 minutes more than R. I doubt it meant much. In all fairness, I think Jim Lehrer did a pretty good job. La Bamba would throw out a gazillion jabs in one sentence and Lehrer let Romney parry each one instead of limiting him. It ended up costing time. I only watched the first few minutes of the debate, but I was quite surprised at Mitt’s superior delivery and body language. I can’t comment on the content as I haven’t done enough research to “fact check” what I heard, but based on delivery and body language; it wasn’t close. Obama has never been very, “presidential,” but he usually appears to have excellent presence and poise on camera; by comparison he did not last night. I do not think that Lehrer lost control. The format was deliberately looser than some previous debates. Lehrer made sure each candidate got a chance to speak and respond to the other’s points. I have seen past debates where the moderator truely lost control. This usually results in one candidate talking over the other so the other never really gets to be heard. I have also seen debates that were tightly controlled and time regemented. Of the three, the tightly regemented and controled debates were the absolute best. I have to say that I think that this was the best run presidential debate I can recall seeing. Thanks for the FC link. What if a computer, similar to the one on Jeopardy but loaded with “the facts” was the moderator and every debater’s falsehood triggered an instant alarm and turned the floor over to the opposing guy? I’d also question the idea that any political party can be labelled a “force of good”. As soon as you reach that stage, you’re reduced to blind partisanship. Democrats, with their horrendous views on abortion, their philosophically unsound support of gay marriage and their completely inappropriate attempts to force birth control coverage on religious institutions–among other things–, have serious problems. I consider the current liberalism to be completely indefensible as an ideology. At the same time, Republicans have become a near-Randian party that offers a full-bodied endorsement of social Darwinism. They are fueled by hatred; they cater to the lowest common denominator; and, corrupted by the Tea Party, they have become almost obsessively intolerant of compromise. Conservatism has been reduced to a pale shadow of its past. I put Chris Matthews and Rush Limbaugh in the same boat. Rank Sophist- I have enjoyed some of your contributions here -thanks – but in reference to the cliche of Republicans and social Darwinism, please read, The Tyranny of Cliches, by Johan Goldberg. It’s a good read and debunks a lot of these types of cliches, such as social Darwinism, social justice, and anti-Catholicism, and so called dogmatism (as if it is a bad thing – I dogmatically stand against abortion and infanticide.). I am a tea partier and your understanding of this movement is a caricature. I listen to talk radio at times and the problem with it is this: they dare to challenge the omnipresent liberal narrative – in the schools, the news media, the entertainment world – with spirited counter-argument instead of just feelings, which, as Dennis Prager rightly asserts, is the defining characteristic of their wordlview. Liberals generally don’t ask what actually works but, rather, what feels good. Yes, some on the right can at times be bombastic, but hateful? Just look at what the Left did to George W Bush. Now that’s hatred and demonization. From a European perspective there is not much of a choice. Generally European intellectuals favored Obama (over McCain and certainly over Bush). Hopes were high. But as far as foreign policy was concerned nothing changed. It has only gotten worse. Romney will support American world dominance (with every means) just as Obama does. I am really surprised if people take this charade seriously. I can’t say this applies to all liberals but I have known a few, and there are others in the public sphere that I would put in this category based on public statements, that actually seem to believe that facts are hateful. I am surprised the media aren’t calling Romney a racist who stalked and beat up on a poor black kid. Mitt Romney, just another George Zimmerman. From a European perspective there isn’t any choice as Europe has no say in who we elect presedent. As a libertarian in the US from my perspective, the differences between them on the issues important to me are only a matter of degree. That said I will vote for Romney as the lesser of two evils. There is one spot in the debate where I thing Romney slipped and missed an opportunity for a good zinger. When Obama said “And I worked with Democrats and Republicans to cut a trillion dollars out of our discretionary domestic budget. That’s the largest cut in the discretionary domestic budget since Dwight Eisenhower”. Romney should have hit Obama with the fact that there hasnt been a budget for the entire time he has been in office. Even durring the first two years when the Dems had a majority in both houses the couldn’t pass a budget. I actually don’t understand why the bunch at MSNBC reacted the way they did. Yes, Romney Â« won Â» the debate but it was far from a massacre and it will change very little in the poll. The reason Romney won is that Obama simply didn’t reacted on his lies. The debunked $716 billion cut to medicare. And Romney always said that he want a 20% tax cut accros the board (which he rececntly said is revenue neutral). 20% = $5 trillion less in revenue. That $5 trillion cannot be filled by capping the deduction at $17,000, closing PBS, Plan Parenthood, and hypothetical new higher paid jobs. Which should have been created by the Bush tax cut which sent the US deficit sky rocketting. Not counting $2 trillion unrequested money sent to the military. Maybe the USA didn’t lose enough child in its useless war in Irak, that they should lose even more in Iran a pathetic country that poses no real threat to anyone but themselves. Romney won because Obama didn’t attacked him on these debunked lies. Obama told more lies than Romney. I have some difficulty with some of the fact check. 1-) The $5 trillion tax cut: First, it is only recently that Romney and Ryan started to say that they would offset it, but they never provided the info that would actually prove that the tax cut would be offset. Second, a loss of revenue has to be offset by another source of income. The math says that if you cut taxes by 20% you reduce the government revenu by $5 trillion in 10 years. How does Romney plan to offset this lack of revenu? We know that capping the deduction at $17,000 is not enough to replace that revenu. Offsetting tax cut by cut in the expense budget only emphasizes that there is a tax cut to begin with. Romney promises 12 million new jobs and higher wages but doesn’t say how it will be done. What happen if these jobs are not created and wages stay the same? After all the Bush tax cut didn’t raise neither employement nor salary. But the 1% saw a steep rise in their income. A question: Do you consider someone who makes about $20,000 working 40 hours and receiving food stamps a free loader? ALL those underlying factors were unmistakably present as Obama when into the debate last night, and both the debate format [e.g. no applause or other feedback â€“ deprivation of Narcissistic Supply] and Romneyâ€™s â€œimageâ€ as a bona fide authority figure further combined to play directly against the subconscious vulnerabilities that are certainly present. There was enough body language indicators in that debate to indicate with some high confidence level that narcissistic vulnerabilities were successfully attacked with the predictable narcissistic reaction resulting â€“ this explains the otherwise baffling submissive aspect of his performance. At one of those above links is a link to a paper: â€œWhen Obama Snaps and Loses It,â€ which describes what happens to narcissists when they don’t get their way. It doesnâ€™t appear things have played out so severely as forecast in that paper…but the potential is still there for some damaging reactions if properly provoked (and those provocations wonâ€™t appear to a non-narcissist like a particularly hostile attack). You don’t describe a household only a single individual. As best I can tell, a healthy person making 20K/yr wouldn’t be eligable for food stamps, so I would consider such an individual a criminal (fraud). Sylvain you seem to be fact challanged. Deebee you are free to show where I’m actually wrong. He lied about the 5 trillion tax (500 billion over 10 years span)is easily proven. Total income tax collected minus the promised 20% tax reduction. That 20% wouldn’t be compensated by closing loophole or without increasing taxe on the middle class. The proposed reduction in taxes reduces the taxes of the richest people more than what they could deduce before the tax cut. So Romney cannot cover is tax cut only by closing loopholes for the rich. To be revenue neutral it need money coming from somewhere else. Romney also lied when he said that his health care plan covered people with pre-condition. It only covers those who had continuous coverage, so if you lost your job and insurance you wouldn’t be covered anymore. Oh dear, here come the ferners again, begging for a Commie POTUS, which doesn’t serve the ferners well at all. When the USA has a weak appeaser Marxist looter as POTUS, the rest of the world descends into social collapse. It is NOT better for Canada, France, or Portugal for the USA to abandon them to their own anarchic shoot-in-the-foot devices. What works for us (economic prosperity) also works for them. Surprise surprise. Yet the extreme fern fools cannot keep their traps shut re our POTUS race (even though in their own countries free speech is a capital offense). Seek, ye ferners, to cleanse your own house, which stinketh mightily, and leave ours alone. PS — Didn’t we have this conversation four years ago when ou ferners insisted that a Kenyan interloper be elected POTUS? And what happened? Are you blind to the misery inflicted on your own ragtag nation because of it? What’s the point of one sided hatred in one hand and blind arrogance in the other? When you have devolved the political system into a simple us vs them attitude… I just don’t know where to go from there. I mean, from one mans perspective, the general idea of being republican is advocating less, right? The government should have no role in regulating our lives, this should be left to individual discretion and then to a lesser extent, the state. So I gotta ask, for a political party so empassioned by the idea of deregulated capitalist freedom, why does this also go hand in hand with restrictions on personal freedoms? Why can’t we have our guns and abortions too? Just doesn’t make much sense to me.